For almost 400 years, the first sentence to this poem has served as metaphor for our lives: no man (or woman) is an island. No one can prosper living alone. Every person is a part of society, and each other. We can’t be alone. We need each other. Sorry to say it Donne, but we are actually islands. Living, thriving islands. Each one of us carries around millions of bacteria that live, reproduce and die within us. Ed Yong recently explores the splendour of the unseen ecosystems within us, in his new book I Contain Multitudes. From the outside an animal looks like a lonely, empty island. But, like all islands, they are flourishing and rich with species. There are plenty of wonderful examples of real islands which have incredible ecosystems. Being isolated for millions of years allows some fantastical creatures to evolve. Think of the oversized, flightless pigeon, the Dodo, on the island of Mauritius, or the giant Moa species on New Zealand, and the giant lemurs on Madagascar. The list goes on. Left alone natural, and sexual, selection will create some incredibly beautiful creatures. One island has perhaps the most unique flora and fauna around today: Australia. Drifting alone for around 30 million years across the vastness of the oceans, it is on Australia where marsupials reign. 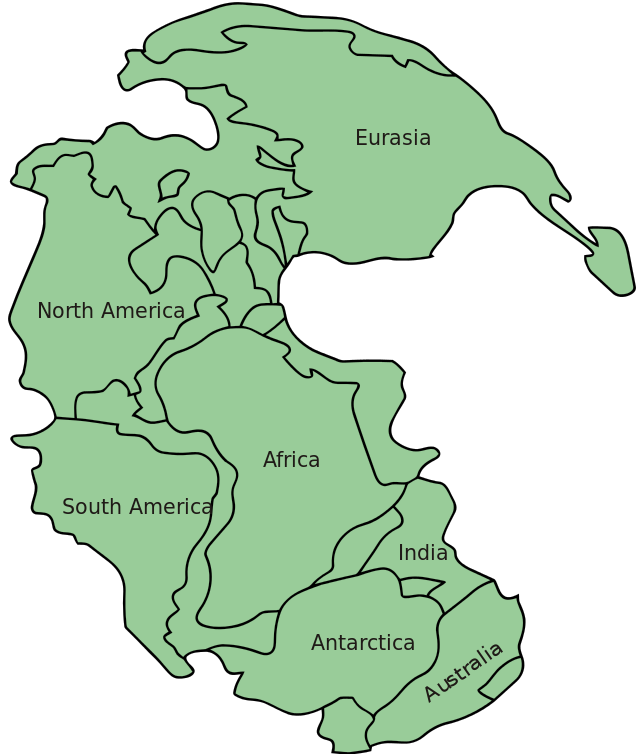 Before the continent of Australia found itself, it was joined with many landmasses into one pretty big one called Pangaea: this was a supercontinent. With one connected area of land animals could move with relative ease from one part to another. Marsupials first turn up in the fossil record in Northern Pangaea (North America) around 65 million years ago, they spread southwards, across South America, over Antarctica and to Australia. Through the great movements of the Earth’s tectonic plates, around 30 million years ago Australia divorced itself from the other landmasses. Carrying with it unique animals. Animals that rear their young in a pouch: the marsupials. Marsupials can be found today in North and South America, but there they have been overshadowed by placental mammals (the mammals like you and I where babies are nourished in the tummy by the placenta). Australia however, until very recently, only had placental mammals which were no real competition to the marsupials: bats. This allowed the marsupials to adapt to the changing environment, and evolve into some incredible creatures. An enormous variety of kangaroos, bigger than a human, sprung across the grasslands: one kangaroo may have even walked instead of hopped. A marsupial lion ambushed its prey from trees. Giant lizards, three times the size of today’s Komodo Dragons, stalked the bush. This really was an island of lost beasts. And they were big beasts. The Order Diprotodontia, which includes kangaroos, koalas and wombats, also includes the biggest marsupials to have ever lived. Within the sub-family Diprotodontinae was the well-known, largest marsupial, Diprotodon. There was another sub-family, Zygomaturinae, which also had another giant species, the not so well-known Zygomaturus trilobus. You might be thinking ‘Great, another massive wombat. What’s so different to Diprotodon to have another blog post?” And rightly so. 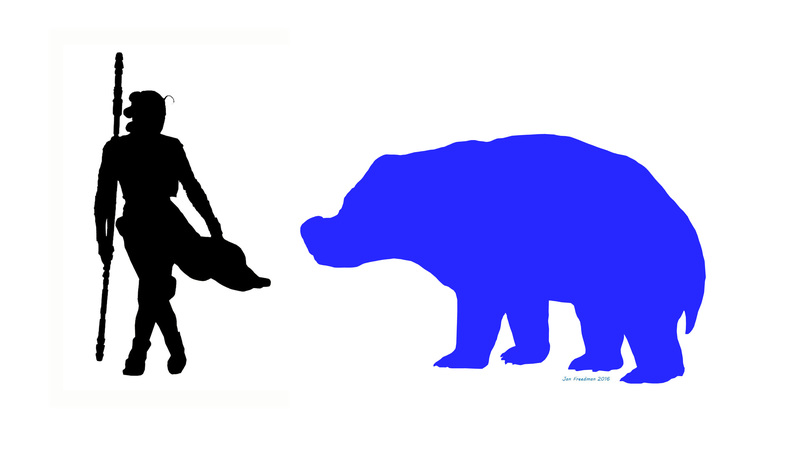 Because Zygomaturus is just another giant wombat. It isn’t even the biggest wombat. But, like the Mona Lisa, this wonderful creature is more mysterious than meets the eye. In honour of 27 years since Quantum Leap first airing, and for ease for you, we will call our beast Ziggy. (Whoa Boy! 27 years?! Where did that go!) Although a good number of fossils of Ziggy have been found across Australia and Tasmania, this still remains a rather enigmatic creature. Perhaps the oddest part of this animal is the skull: so odd that reconstructions are somewhat comical. A good friend who suggested writing about this strange marsupial, called it ‘squishy bear face’ because of reconstructions they had seen! And it does rather look like a bear that ran into a wall. Ziggy’s head is weird. Very weird. And very different to Diprotodon in many ways. The skull was huge. So big, that it was filled with sinus cavities to make it a little lighter. The teeth were complex compared to its big cousin. Complex teeth patterns makes the teeth stronger. The enamel is not just on the outside of the tooth (like our teeth) but weaved into the tooth, making it able to wear down slower. And this indicates that Ziggy could eat coarser tougher foods. One part of Ziggy’s skull in particular has caused a lot of speculation about how this creature may have lived: the peculiar bony attachment on its nose. It is a big bone attachment, and no one really knows what it was for. Some researchers have suggested Ziggy actually had a trunk. Although others point out that a trunk needs a broad surface to have the muscles attach too, like in an elephant (which Ziggy doesn’t). Other researchers suggest that there was a high nasal cavity because it had a similar lifestyle to a hippopotamus. Yet another idea is that the bony attachment held a horn, and with horns being extremely rare to fossilise, none have ever been discovered. The consensus appears to be that this big nasal bone held some pretty big upper lips: a large muscular flap of skin hung from the face – not as long or muscular for a trunk, but strong enough to manipulate objects. Fossils of Ziggy have been found all over Australia, and Tasmania. 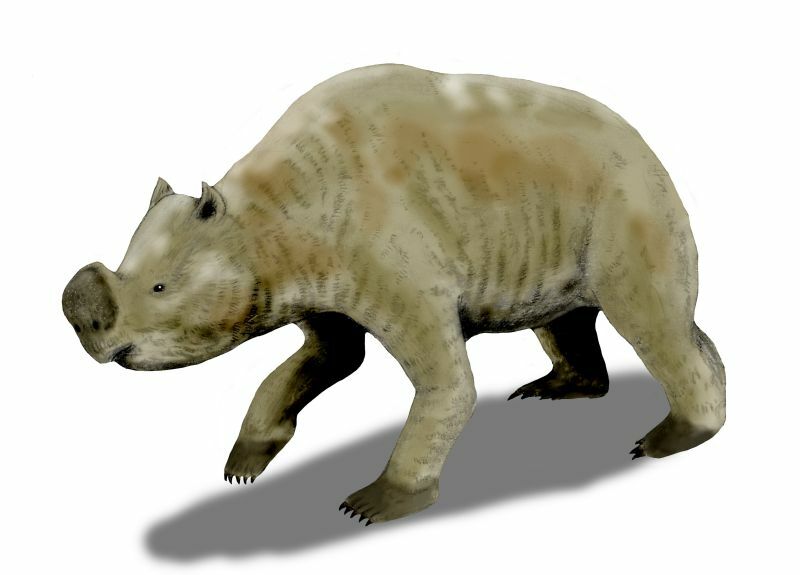 The distribution of the finds indicates that this giant wombat did prefer slight wetter environments to live in. 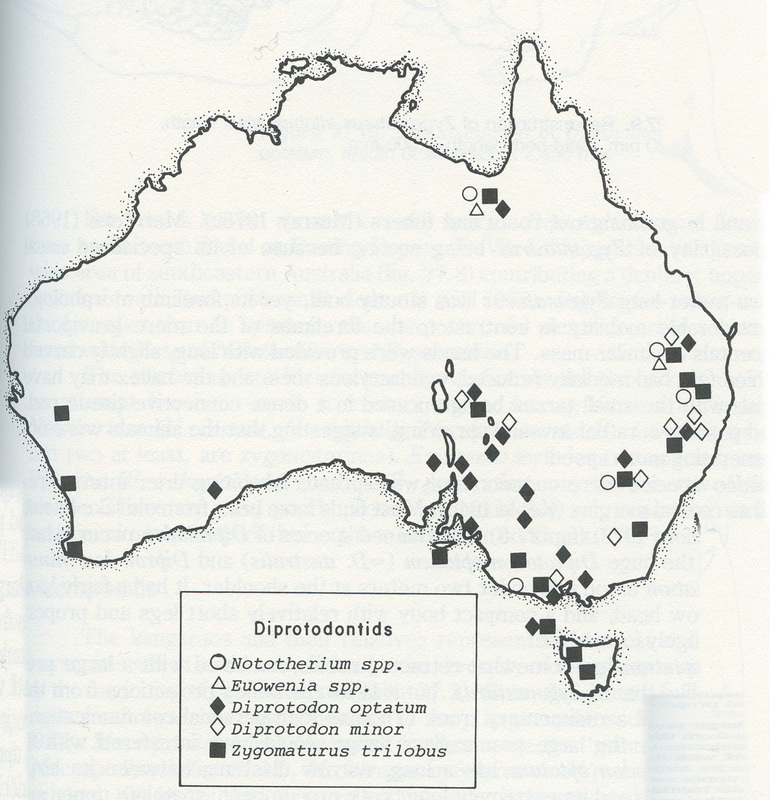 Diprotodon was more widely distributed. The continent may have been large enough to be home to two species of large herbivores because of their different diets: Ziggy happily chomping through tough vegetation, while Diprotodon was at home enjoying luscious, softer green leaves. The fossil finds of Ziggy and other Pleistocene giants. Notice Ziggy’s distribution is close to the coast. 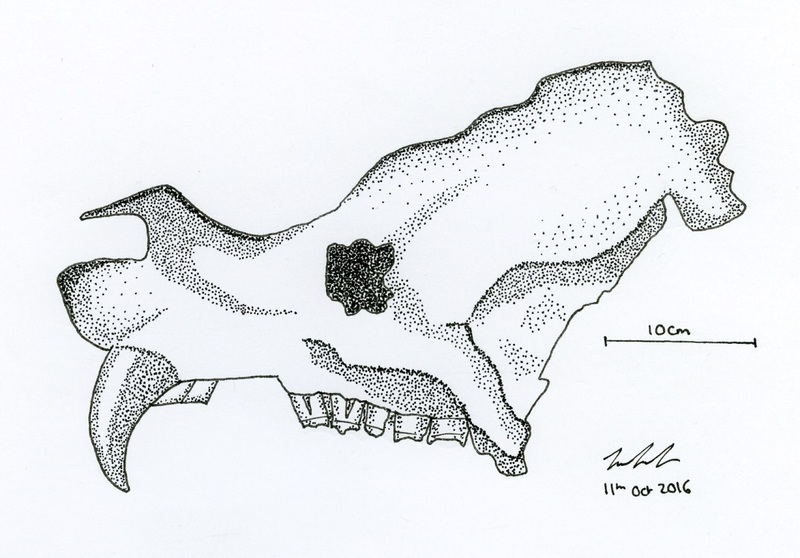 (Image from Quaternary Extinctions. page 264). Ziggy and her kind were around for over 15 million years, which is a pretty long time for any Sub-Family. Her success was due to her isolation. Island living animals have the time to adapt to the changing environments on that island, and the other inhabitants. So when a new animal appears, it can cause havoc. This happened when North and South America joined together and animals from both land masses moved up and down, entering new environments, and wiping out species. And something happened in Australia too. Around 35,000 years ago Ziggy vanished. She clung on in small populations on Tasmania. But by around 24,000 years ago, Ziggy vanished forever. Her disappearance coincides with the arrival of humans around 50,000 years ago. However, with these early Australian living out in the open, there are few sites showing clear evidence of hunting. (This is compared to the abundant fossils found in caves in Europe and America where the remains are more protected from the outside world.) As a little aside, thanks to Lee Constable, I recently discovered that wombats will pee if their bottoms are tickled. Obviously, the first thing I thought when I saw this, was did the first Australians try something like this with Ziggy? Tickling a giant wombat’s bottom would have been an interesting thing to witness. At around the time Ziggy and her kind started to disappear, the world was changing. Sea levels were lower as water was trapped in the great ice sheets in the northern hemisphere. Worldwide, the climate was drier. Australia was moving slowly northwards, getting warmer, and beginning to lose its luscious tropical rain forests. As with many of the great Pleistocene extinctions, there was likely to be more than one factor contributing to the end of this species. Ecological stresses would have put intense pressure on small groups. Coupled with a new carnivore on the scene, our squishy faced bear vanished forever. “We are all islands”? “He disagrees with Donne? !” Now, dear reader, you may be wondering where my romantic side has gone. For those who have followed this blog for the last two and half years, you will know I am a romantic at heart. And there is nothing wrong with romanticising science so long as the reader comes away swoon by the gorgeous key facts. I do believe 400 years ago, Donne had it right. No one should be alone. The ocean we live in each day is full of other islands. We may go along drifting, bumping into other islands every now and again. Perhaps we let them float by. Maybe we hold onto them. Even with millions of people around us, our little lives can sometimes seem as big, and empty, as an ocean. Life is short. Don’t let something special drift by. A special thanks to Gilbert Price, vertebrate paleoecologis at The University of Queensland, for his help with gathering information for this post. Price, G. (2012), ‘Plio-Pleistocene climate and faunal change in central eastern Australia.’ Episodes-Newsmagazine of the International Union of Geological Sciences 35. 1 160. This entry was posted in Zygomaturus and tagged Australia, Diprotodon, Marsupial, Marsupial Lion, megafauna, Pleistocene. Bookmark the permalink. This is beautifully written and inspiring. I love your opening quote but more so learning about Ziggy! Thanks for the work you do. I think you have fallen into the all too common trap to assume that there are no native placental mammals except bats in Australia. That’s wrong as the continent has a considerable native population of muroid rodents. It’s possible marsupials outcompeted placental mammals on this continent.